Average insurance rates in North Carolina for 2019 are $810 a year including full coverage. Comprehensive, collision, and liability cost approximately $180, $328, and $210, respectively. 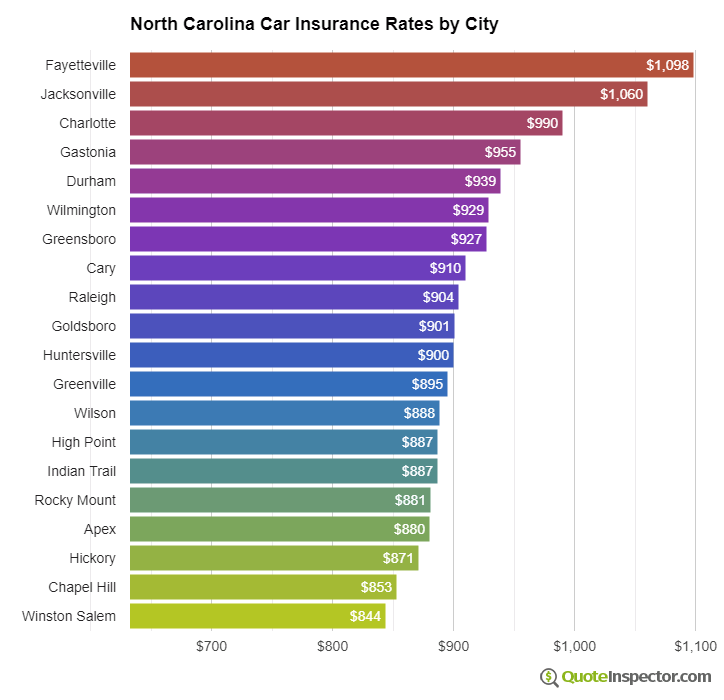 Fayetteville and Jacksonville average the highest car insurance rates, and the two largest writers in North Carolina are Nationwide and State Farm. For a driver around age 40, prices go from the low end price of $248 for just liability coverage to a high of $1,748 for a high-risk insurance policy. These differences highlight why it is important to compare prices using their specific location, instead of depending on generic averages. Enter your North Carolina zip code below to view companies that have cheap auto insurance rates. The chart above shows average North Carolina auto insurance prices for different risks and coverage choices. The cheapest discount price is $466. Drivers who choose higher $1,000 deductibles will pay $694. The average price for a middle-aged driver with a clean driving record using $500 deductibles is $810. Choosing low $100 deductibles for collision and other-than-collision coverage could cost up to $1,034. High risk drivers could be charged as much as $1,748. The cost for full coverage insurance for a teenager can be as high as $2,978. Insurance rates in North Carolina can also vary considerably based on the type of vehicle you drive, your driving record and age, and physical damage deductibles and liability limits. The make and model of vehicle you drive is a large factor when calculating the cost of auto insurance in North Carolina. Buying a cheaper and safe model will be cheaper to insure due to cheaper repair costs and less likelihood of injuries in accidents. This table shows car insurance premium estimates for the most popular vehicles in North Carolina. Your auto insurance company influences the cost of coverage. Each company sets their own rates, and prices can change based upon different risk factors. In North Carolina, car insurance prices range from $645 with Progressive to as much as $1,075 with Allstate. Companies like Utica National, Liberty Mutual, and NC Farm Bureau fall somewhere in between. These are probably not the prices you would have to pay, as your location, your driving history, and the type of vehicle you drive all factor in. Where you live in North Carolina has a huge impact on auto insurance prices. Less congested rural areas might see rates around $600 a year, whereas some neighorhoods in Fayetteville and Jacksonville could have rates closer to $1,100. Even different neighborhoods with close proximity in the same city can have significantly different rates. These wide price ranges demonstrate why it is so important to get rates for your specific North Carolina zip code. With so much variability in prices, the best way to figure out which insurance company is cheapest is to get quotes from multiple companies. Each insurance company uses a different rate calculation, so the rates can be significantly different. How Much Does Auto Insurance Cost for 16 Year Olds in North Carolina? How Much is Auto Insurance for Teenagers in North Carolina? How Much Does Insurance Cost for a Chevrolet Silverado in North Carolina? Who Has the Cheapest Insurance Quotes for a Ford Explorer in North Carolina? How Much is Insurance for a Toyota Camry in North Carolina?